Should I travel, or just stay home? 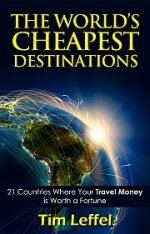 Home » Cheap Asia Travel • General • Long-term travel • Travel bargains • Travel industry » Should I stay or should I go now? “Today is free seating!” the perky Garuda ticket agent said as she handed us our blank boarding pass for the flight from Bangkok to Jakarta. It was easy to see why. As the plane taxied down the runway, it looked to be barely 10 percent full in the cabin. We had checked our e-mail at cafes on Khao San Road before departure, most of the messages being like the one I got from my sister. “What are you thinking? !” she asked. “Everyone is trying to get out of that country. Why are you going IN? But we had a plan. On May 19, we landed at the airport, slept there that night, and flew out the next morning for far-flung Sulawesi on the 20th. Sulawesi was calm and on the little island of Bunaken where we were going snorkeling, we could live like royalty on a pittance. Our beach bungalow with an amazing view and it’s own bath was $4 a night, which included all three meals. On May 21, the corrupt ex-general Suharto was forced to resign and there was much rejoicing in the streets. The currency problem stuck around though, which was terrible news for them, the opportunity of a lifetime for us. The $350 we cashed upon arrival lasted for five weeks. We could walk into virtually any restaurant, knowing we could afford it. We hired private cars and drivers to take us from city to city instead of the crowded 3rd-class buses we were used to as backpackers. We rented spacious rooms with nice sheets, daily maid service, and towels. Suddenly we had gone from shoestring travelers who had to watch every dollar to the rich westerners everyone who sold anything always thought we were. I loaded up on wood carvings priced in local currency and only half-heartedly bargained, just to keep the ritual intact. When someone has worked on something for weeks and is selling it for the equivalent of $8, it feels pretty heartless to drive down the price. A lot of would-be travelers take the Clash to heart. The danger of going abroad—to what they don’t know—-often trumps the danger already surrounding them in the place they do know. When a destination shows up on CNN, whether it’s Egypt and Tunisia one month, Mexico or London the next, their gut reaction is to cancel everything—and strike it from their list for the next five years or so. When there are problems, of course, that’s when the best deals come into play. When my family traveled around Mexico in the summer of 2009, after Swine Flu and a round of Ciudad Juarez violence hit the news, we could get a bargain rate on hotels everywhere. Every bar had a long happy hour. Restaurants were running specials every night. I live in the United States of America, a country with 2.4 million people in prison and way too many guns in the hands of nutjobs. Are other places really more dangerous than here? Not if you have the bad luck to go roller skating in Texas, mall shopping in Tuscon, or get involved in a family feud in Ohio. Or you know an ex-con in Michigan. Want to see acts of random violence? Watch your local news each night. Is Norway safe? It used to be. Is England safer than Egypt? I’d rather take my chances in Cairo than London this week. But a month from now, London will be on sale and the dangers will be gone. The answer to all this is knowledge. You no longer have to depend on the news a few big corporations are feeding you. You can go find good international news from the usual subjects like The Economist or the BBC, but more importantly, you can go to the source. You can read local papers (most cities have at least one in English online). You can go onto message boards. You can get int touch with friends of friends via social media. Let’s face it, sometimes if you stay it won’t be trouble, but if you go it will be double. Here are some safe travel resource links. The point is, a little local knowledge and a grasp of geography will tell you whether a place is truly dangerous or whether just part of it is, whether you should steer clear until things cool off, or whether you should just tweak your itinerary. Usually the answer will end up being…GO! I agree, more often than not, you should go! Short of spinning a globe and placing my finger to stop it, I usually pick a place by the cheapest flight which usually means undesirable and off-peak, but hell I always have a great time! My big secret is searching for flights on skyscanner.com and I usually pay 50% or less than the going rate. You are absolutely right! Do not forget about simple rules of survival, take necessary things and track current state of your travel places and your travel will be pleasant, comfortable and safe. But anyway be carefull! Prepare for your travel before travel.